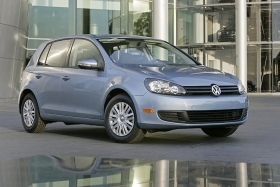 The VW Golf, pictured, could get some competition from a new entry-level Volvo. Jacoby is driving the product assessment at Volvo, which was acquired last summer by Zhejiang Geely Holding Group Co. of China. Volvo had been owned by Ford Motor Co.
Last month, Doug Speck, CEO of Volvo Cars of North America, told Automotive News that the automaker is considering a small car that targets BMW's 1 series and a compact crossover to compete with the BMW X1. "The luxury station wagon segment has been on the decline over the last decade, and we have adjusted our product lineup with the XC products," Speck said.